Last season, the New York Red Bulls became the first Eastern Conference team to win the MLS Supporters Shield in three seasons. Meanwhile, Sporting Kansas City ended a four-year MLS Cup drought defeating Real Salt Lake in the MLS Cup Finals on penalties. It is the first time since 2004 that two separate Eastern Conference Teams held those trophies and it signifies a changing of the guard in MLS writes Christian Araos. The Red Bulls and Sporting KC have not made significant changes to their rosters but a slew of other teams have making this conference as competitive as it has ever been. 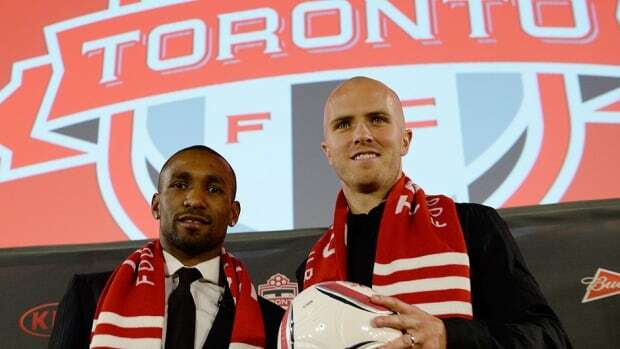 Toronto FC are obviously the most notably different team signing Michael Bradley and Jermain Defoe as Designated Players and signing Julio Cesar on-loan from Queens Park Rangers but the Philadelphia Union and the Columbus Crew have also improved their rosters. The Fire replaced president of soccer operations Javier Leon and head coach Frank Klopas with Frank Yallop who will assume both roles. Yallop, who won the 2012 Supporters Shield with the San Jose Earthquakes, is building a squad from the back with a completely revamped back four. Yallop traded Jalil Anibaba and draft picks to the Seattle Sounders for a pair of centerbacks, Colombian Jhon Kennedy Hurtado and former US U-23 international Patrick Ianni. The Fire also acquired Jamaican Lovel Palmer from Real Salt Lake to be their right back. Palmer can also play left back possibly allowing the Fire’s First Round draft pick, Marco Franco, to play at right back. However Yallop traded centerback and 2012 Rookie of the Year Austin Berry to the Philadelphia Union for allocation money. While Berry was a valuable member of the Fire’s defense, it would have been impossible for them to retain Berry and attempt to sign forward and reigning MLS Most Valuable Player Mike Magee to a new contract. Magee scored 21 goals and kept Chicago in playoff contention throughout last season. The Fire will likely make Magee a designated player using the roster spot formerly used by Uruguayan midifelder Arvelo Rios whose contract option was declined. The onus will be on Magee to carry the goalscoring load for another season but he is in contention for a spot on the USA World Cup roster, despite never being capped, which could test the Fire’s depth up top. The Fire’s midfield has experience with veteran Jeff Larentowicz leading the way. US U-20 international Benji Joya, on-loan from Santos Laguna in Liga MX, has had an impressive preseason and could have a breakout season. Dilly Duka and Patrick Nyarko are also solid options for the Fire going forward with the Brazilian Alex also contributing to the midfield. Last year, the Fire narrowly missed out on the playoffs on goals scored but it was the fact that they gave up 52 goals in 34 games, second worst in the East, that sank their playoff chances. If the Fire can cut that while maintaining their goal total, then they might be able to sneak into the playoffs this year. PREDICTION: 6TH (12/1 – BetVictor) – Click here to take advantage of our up to £25 free bet sign-up offer to all new customers. Promising times are ahead for the Crew who were bought by Anthony Precourt last August. The Crew are slowly revamping their roster in an attempt to end a two-year playoff drought which may be looked back upon as an interlude between two eras for the club, the first being the Guillermo Barros Schelotto era in which the club won two consecutive Supporters Shields and an MLS Cup and the current one with Precourt as owner and former US international Gregg Berhalter as new head coach. Berhalter was the first American to coach in Europe spending almost two seasons with Hammarby in the Swedish second division. He was fired for not playing offensive soccer despite having more wins than losses during his tenure. The former starting defender for the US at the 2002 World Cup is building his squad from the back with a potential World Cup defender being his most notable acquisition of the offseason in Michael Parkhurst. After competing in the Champions League with Danish club FC Nordsjaelland, Parkhurst joined German club FC Augsburg but only made two appearances for the club. While he is used as left or right back for the US National Team, Parkhurst will likely be a center back partnering with newly acquired Costa Rican international Giancarlo Gonzalez. Another newly acquired Costa Rican international is left back Waylon Francis. Josh Williams, the Crew’s lone starting defender from last season, will move to right back. The Crew are a little unproven in the midfield. Dominic Oduro was the team’s leading scorer from right wing last year but it will be harder for him to replicate his 13 goal season playing in a 4-4-2 this season. Bernardo Anor made a successful return from a torn ACL but will be hopeful to only have to play left wing after injuries forced him to move around in the midfield. Tony Tchani and Will Trapp are not a great duo in the center of the field but the hope for the Crew is that Trapp, a former US u-20 International, can excel in his second season with the Crew. Newly acquired Hector Jimenez provides solid depth at the wings as well. Gonzalo Higuain’s older brother, Federico, is the Crew’s number ten and will be the difference maker for this team. Higuain scored 11 goals and had nine assists in 29 starts last season. He will look to link up with another Tico in Jairo Arrieta. Arrieta had a terrible 2013 season scoring three goals on 64 shots in 26 appearances, a total dropoff from the 9 goals on 41 shots in 18 appearances he had in 2012. And there is where the Crew’s success will be determined. New goalkeeper Steve Clark, signed from Honefoss in Norway, is a darkhorse contender for newcomer of the year. The award has never gone to a goalkeeper but Clark was a former Best XI player in the Tippeligaen and may be one of the best American players you’ve never heard of. PREDICTION: 8TH (16/1 – BetVictor) – Click here to take advantage of our up to £25 free bet sign-up offer to all new customers. D.C. United won three games last season. They also won the U.S. Open Cup. In essence, they were Wigan except there’s no relegation in America. So the team is in the unique position of not only trying to rebuild from the worst season in franchise history but also trying to build a squad to compete in the CONCACAF Champions League. They’re doing this by going domestic and by going young. 31-year old Lionard Pajoy: gone. 34-year old Carlos Ruiz: gone. 35-year old Dwayne De Rosario: gone. 32-year old Marcelo Saragosa…you get the point. In all, there are only six outfield players left from the 2012 team that reached the Eastern Conference Final. A perfectly acceptable group of MLS players are coming in. Right back Sean Franklin joins the team from the LA Galaxy. Veterans Bobby Boswell and Jeff Parke will be at center back while Cristian Fernandez, the only non-American based new signing, will play at left back after signing for free from Almeria. Davy Arnaud is another MLS veteran joining the team and will provide some help on right wing. Ideally the goal would be for him to provide depth for Nick DeLeon and Chris Pontius but Pontius’ career has been sidetracked by injuries and he suffered a setback rehabbing a surgically repaired hamstring. Luis Silva, Perry Kitchen and Jared Jeffrey are all decent youngish midfielders with the latter two being former US U23 internationals. Eddie Johnson revived his career with the Seattle Sounders but a contract dispute saw him traded for allocation money in the offseason. Johnson will get the DP wages he wants with United soon enough but the onus will be on him to live up to the new status he has earned. He is a key component of the national team for his abilty to play as an inside forward or up top. He will be playing the latter position for United, partnering with former New York Red Bull Fabian Espindola. Former Derby County forward Conor Doyle will provide depth at forward. United probably won’t make the playoffs but if they struggle to improve on their season last year and/or get trounced in the CCL, don’t be surprised to see head coach and club legend Ben Olsen finally get the sack. PREDICTION: 9TH (33/1 – BetVictor) – Click here to take advantage of our up to £25 free bet sign-up offer to all new customers. How much can Dominic Kinnear muster from this roster? The Dynamo Head Coach has gotten the most out of a solid squad for the past three years nearly making three straight MLS Cup Finals. However, Kinnear has not really done a whole lot to make the team better in terms of acquiring new talent. When Geoff Cameron went to Stoke City, the Dynamo went cheap and re-signed Ricardo Clark after his contract with Eintracht Frankfurt expired to fill the void he left in midfield. Clark has done well in that role working with Warren Creavalle in the center but Cameron’s other position with the Dynamo, centerback, may be the team’s problem area. Bobby Boswell is with DC United leaving Jermaine Taylor as the lone veteran and the two options the Dynamo have to pair Taylor with are not convincing. Eric Brunner has not played a full season since 2011 with the Portland Timbers and David Horst missed almost all of last season with the Timbers after suffering a displaced tibial plateau fracture in his right leg last April. The Dynamo’s fullback options are more convincing with Kofi Sarkodie and Corey Ashe each capable of charging forward from right and left back, respectively. The most notable aspect about the Dynamo’s attack is their ability to overlap as Sarkodie will combine with Honduran international Boniek Garcia on the right and Ashe will combine with American international Brad Davis on the left. Those four players push the Dynamo’s buildup play and will look to feed to either Will Bruin or Omar Cummings up front. Once touted as a star for the future, Bruin struggled last season only scoring eight goals in 30 appearances for the Dynamo. That total was half his mark for all competitions in 2012, which was a franchise record. Bruin has not taken the next step into becoming a bonafide star in the league and the Dynamo’s patience with him may run out. Cummings is a serviceable alternative but Bruin has the greater potential and the greater burden now after Brian Ching retired. Former England U19 international Giles Barnes will be a key playmaker for Houston and will build off of a nine goal, four assist season last year. Tally Hall is a reliable option in goal so the Dynamo will be able to create chances for themselves in attack and have the goalkeeper needed to stop shots but do they have the personnel to finish those chances and to shut down their opponents? PREDICTION: 7TH (10/1 – BetVictor) – Click here to take advantage of our up to £25 free bet sign-up offer to all new customers. The Impact sputtered late last season losing six of their last eight games culminating in a 3–0 trouncing by the Houston Dynamo in last year’s knockout round. Although, most of the team that made the playoffs last season is back, there is little to suggest that this team will make it back to the playoffs. New head coach Frank Klopas will have his hands full with a defense that is uninspiring to say the least. Alessandro Nesta retired to take an assistant coaching job leaving behind a back four with more questions than answers. Matteo Ferrari is the anchor at center back but is 34. Heath Pearce may join the club if his trial is successful and could contribute if he returns to the form he had with the New York Red Bulls before suffering a hip injury. Nelson Rivas is gone and Jeb Brovsky and Hassoun Camera are simply not that good. Goalkeeper Troy Perkins is good but did not record a clean sheet in his final nine starts last season. Patrice Bernier and Hernan Bernardello are a very good center midfield pairing but Bernier will turn 35 in September and there is a steep dropoff between them and their potential replacements. Santiago Gonzalez is the club’s main signing, joining the Impact as a DP after guiding Sud América to promotion in Uruguay. Gonzalez will be on left wing with MLS veteran Justin Mapp playing wide right. Felipe Mertins will be the club’s number ten and he recorded eight assists last season so the Impact’s midfield looks promising. Sanna Nyassi can be a difference maker off the bench or could start for Gonzalez at left wing. Their attack would be promising too based on recent history but don’t be too convinced. Yes Marco Di Vaio scored 20 goals last year but he is set to turn 38 next year and will need Andrew Wenger to show more for himself than the five goals in 47 appearances he currently has. There is little to suggest that the Impact can keep the ball out of the net next year and it will be hard to believe that the Impact can put the ball in the net as much as they did last year. Two signs which point to it being a long year in Quebec. PREDICTION: 10TH (16/1 – BetVictor) – Click here to take advantage of our up to £25 free bet sign-up offer to all new customers. The Revolution were one of the league’s pleasant surprises last year as the young team ended a three-year playoff drought winning as many games last year (14) as they did the previous two years combined. But they lose a club icon in goalkeeper Matt Reis who retired after a trying season last year. With Reis gone, head coach Jay Heaps will have two options in Brad Knighton and Bobby Shuttleworth. Although Heaps won’t term him as such, Shuttleworth is the incumbent after starting more than 20 games for the Revolution last year after Reis left the team to care for his father-in-law who had been severely injured in the Boston Marathon Bombing. Knighton has experience fighting for his place on squads. He replaced Joe Cannon as a starter in Vancouver but was replaced by David Ousted and joined the Revolution in this year’s re-entry draft. The Revolution’s back four is among the best in the league provided that they give last year’s Defender of the Year José Gonçalves the contract he wants. Gonçlaves came to the Revolution after an injury-plagued career in Europe and can definitely be serviceable to many top-flight clubs there. He will partner with the improving A.J. Soares who missed time last year due to injuries. Darius Barnes and Jamaican international O’Brian Woodbine will compete for time at left back with the exciting right back Andrew Farrell set to build off of a great rookie year. Scott Caldwell had a good year at defensive midfield but lost his spot to the veteran Andy Dorman towards the end of last season and the two will compete for time in that position. Lee Nguyen and Kelyn Rowe will be the two attack minded central midfielders working in front of either Caldwell or Dorman. Both of those players can continue to grow into exciting players though they need to develop their defensive game a little bit more. Newly acquired Daigo Kobayashi and Chris Tierney are options in the middle as well. Kobayashi may also move Rowe out to right wing, which would allow Rowe to be more of influence going forward and develop into a star attacking player. That would put him on Diego Fagundez’s level. At 19, Fagundez is already an MLS star having scored 13 goals, the most for a teenager in MLS history. He has drawn comparisons to Luis Suarez for his eye for goal, flair and direct play but maintains a down to Earth personality. His national team prospects would be excellent but he cannot become a US citizen until the fall of 2018, unless he gets married, since he emigrated from Uruguay at the age of 5. While Fagundez and Rowe are exciting prospects on the wing, the Revolution are going to try several options up top in hopes of finding a center forward who can regularly contribute. Honduran international Jerry Bengtson has been disappointing ever since being signed to a DP contract and Dimitry Imbongo has been inconsistent. That leaves two relatively new options in Charlie Davies, who the Revolution signed for free from Randers FC, and Teal Bunbury, acquired in a trade with Sporting Kansas City. Each player is looking for a second chance after injuries derailed their promising career. Davies scored for the US National Team against Mexico at the Azteca in World Cup Qualifying in 2009, signed for Sochaux in Ligue 1 that summer but nearly died in a car accident while with the national team in October and has not been the same player since. Bunbury also scored for the national team in 2011 but tore his ACL in 2012, missing ten months of action, which led to him being crowded out at SKC and expendable. Gonçlaves enjoyed a second-chance last year guiding the Revolution back to the playoffs but it will be the forward who takes his second-chance this year that will determine if the Revolution can make it to the playoffs for a second straight time. PREDICTION: 3RD (12/1 – BetVictor) – Click here to take advantage of our up to £25 free bet sign-up offer to all new customers. The New York Red Bulls finally won a trophy last season as they won the Supporters Shield with a 5–2 win against the Fire on the final day of the regular season. They will retain most of the pieces of that squad as they look to defend the Shield and push for their first MLS Cup. They have a squad deep enough to do that and compete in the CONCACAF Champions League. Luis Robles will remain the Red Bulls’ number one even though Ryan Meara is healthy though either goalkeeper can do well in that role. The back four remains largely intact although center back Markus Holgersson left for Wigan Athletic. Former Barcelona B captain Armando will partner with Jamison Olave and be Holgersson’s replacement. Costa Rican international Roy Miller and Kosuke Kimura will be the full backs. The main concern for the Red Bulls midfield is their playmaking ability which is why rumors sparked about them attempting to make Xavi their third DP. Those rumors ultimately were unfounded and the need is being addressed internally as they will rely on either Eric Alexander or Peguy Luyundula to handle that task. Dax McCarty will be the other key in the center midfield and is one of the best defensive midfielders in a league known for producing great defensive midfielders. Connor Lade, Lloyd Sam and Jonny Steele will be out wide. Tim Cahill and Thierry Henry provide the star and firepower up front but Henry is showing signs of age and cannot be relied upon for an entire season. Fortunately for the Red Bulls, Cahill can handle the load perfectly and is an MLS MVP contender. They also have the depth to allow for Henry to be used rotationally with Bradley Wright-Phillips and Luyundula capable of playing as a forward. The Red Bulls experience makes them a known commodity and their depth can help them deal with the longer season. The question for this team is not if they can make the playoffs but what will they do when they get there. PREDICTION: 2ND (15/8 – BetVictor) – Click here to take advantage of our up to £25 free bet sign-up offer to all new customers. Of all the MLS clubs in the United States, the Philadelphia Union had the best offseason. I already mentioned the Austin Berry trade but that move is a tremendous trade to make and it allows for the Union to have a young and solid center back pairing with him and Amobi Okugo. Sheanon Williams is one of the better right backs in MLS and will look to put himself in contention for the US National Team for the 2018 World Cup cycle. The team’s question mark comes at left back with Ray Gaddis and Fabinho contending for the starting spot with the latter gaining a slight edge due to his attacking ability. Maurice Edu is the team’s most noteworthy addition joining the Union on a one-year loan from Stoke City. Edu’s lack of playing time with Stoke saw him fall off the US National Team radar but if he is playing at the same level as he was with Rangers, then he should be in Brazil. Brian Carroll will join him in the midfield in a holding midfield role with Vincent Nogueira being the team’s primary playmaker after signing from Sochaux. Chaco Maidana is the team’s third DP signing with the Union as a free agent after he last played for Argentinos Juniors and will look to use his one-on-one abilities to take on defenders from left wing. Veteran Sebastian Le Toux will be the club’s right winger with Danny Cruz being a reliable option if Le Toux were to go through another one of his notorious drops in form. Like the Dynamo, the Union’s chances depend on how well their young striker does. Jack McInerney started his season superbly scoring 10 goals in 15 matches, earning a spot on the USA Gold Cup squad. However McInerney was replaced by Eddie Johnson during the tournament and struggled with the Union only scoring two more goals for the rest of the season. At 21, McInerney still has the best of his career in front of him but he will have to be more consistent since the Union cannot rely on Connor Casey to handle the goalscoring load for an entire season. McInerney will be surrounded by players who will create plenty of chances for him to convert which makes the job easier for him. The challenge is for him to be a poacher and convert those chances and to fire the Union into the playoffs. PREDICTION: 4TH (33/1 – BetVictor) – Click here to take advantage of our up to £25 free bet sign-up offer to all new customers. The defending MLS Cup champions had a quiet offseason only trading Teal Bunbury and trading for Sal Zizzo and Andy Grenebaum. Zizzo will provide some depth in the wings when Graham Zusi is on national team duty and Grenebaum will compete for the starting goalkeeper job vacated by the retired Jimmy Nielsen. Nielsen’s backup Erik Kronberg looks set to be the opening day starter but Grenebaum, formerly the starter with the Columbus Crew, should receive minutes in the early going as Head Coach Peter Vermes looks to find a starter in goal. Sporting’s defense stays the same with a back four from left to right comprised of Seth Sinovic, Matt Besler, Aurelian Colin and Chance Myers. Look for Ike Opara to fill in for Besler when he goes to Brazil with the national team. Sixteen year old, Erik Palmer-Brown may make a senior team debut at some point. Palmer-Brown is the only 1997-born in MLS and has been the target of two transfer bids from Juventus (Yes. THAT Juventus). A solid, well-defined trio of Paulo Nagamura, Benny Feilhaber and Oriol Rosell run SKC’s midfield. Rosell, an alumnus of La Masia, anchors the trio with Feilhaber being the playmaker going forward. Peterson Joseph and Jacob Peterson provide solid depth in the middle for club as it will be tested early with a CONCACAF Champions League quarterfinal against Cruz Azul coming on March 12. Zusi is SKC’s most notable player and can play either wing or in the middle. He is as well-rounded a winger as can possibly be with his crossing and finishing ability scoring six goals and tallying eight assists last season. He has a slew of options to choose from when crossing from the right. C.J. Sapong may not be fit for the season opener but is the club’s main option coming from the inside left. That would likely result in Dom Dwyer moving from striker to the left side which he is capable of doing. Dwyer usurped DP Claudio Bieler for the starting forward spot late last season after a loan spell with Orlando City in which he scored 15 goals in 13 appearances. Bieler has reclaimed the starting spot with a strong preseason in which he scored four goals. How SKC handle the CCL and MLS overlap will go a long way in determining their likelihood of a repeat but they certainly have the talent to repeat as MLS Cup champions. PREDICTION: 1ST (7/4 – BetVictor) – Click here to take advantage of our up to £25 free bet sign-up offer to all new customers. The best offseason for last. On paper, Toronto FC are already MLS’ Most Improved Team. They signed Brazilian number one Julio Cesar on loan from Queens Park Rangers to be their number one goalkeeper and also added Bradley Orr from Blackburn Rovers to play at right back. Orr should be fit to play in TFC’s opener and will have former Newcastle United teammate Steven Caldwell next to him as Caldwell and Doneil Henry form the team’s center back pairing. Next to Henry is another TFC homegrown player in Ashtone Morgan who will be at left back. Jeremy Hall, Gale Agbossoumonde and Justin Morrow are all reliable options on the bench. Jonathan Osorio and Michael Bradley will be the partnership in the center of the field with Kyle Bekker being the bench option. Osorio is young at 21 and Bekker has not played a full season in MLS yet so the minutes may catch up to the youngsters leaving the onus on Bradley to compensate. Former FC Dallas winger Jackson will run the right flank while Alvaro Rey will run the left wing. The soon-to-be 36-year old Dwayne De Rosario will likely see reduced time this season as TFC have two DPs up front in Jermain Defoe and Gilberto. De Rosario’s playmaking ability is a vital asset for TFC to have off the bench. He may also be needed to start should Defoe head to Brazil with the England squad or if the pair cannot click. That’s one of the two issues the new TFC will have this year. It is up to head coach Ryan Nelson to get all the new pieces to fit in and function as a cohesive unit. Even if he can do that, TFC might not have the depth to make them an elite MLS team. A lesson they might learn in the early rounds of the playoffs. PREDICTION: 5TH (7/1 – BetVictor) – Click here to take advantage of our up to £25 free bet sign-up offer to all new customers.